Bainbridge Illustration Board 172 HP Smooth 760mm x 510mm - A fine tooth surface with rag content to achieve controllable performance using wet or dry media. 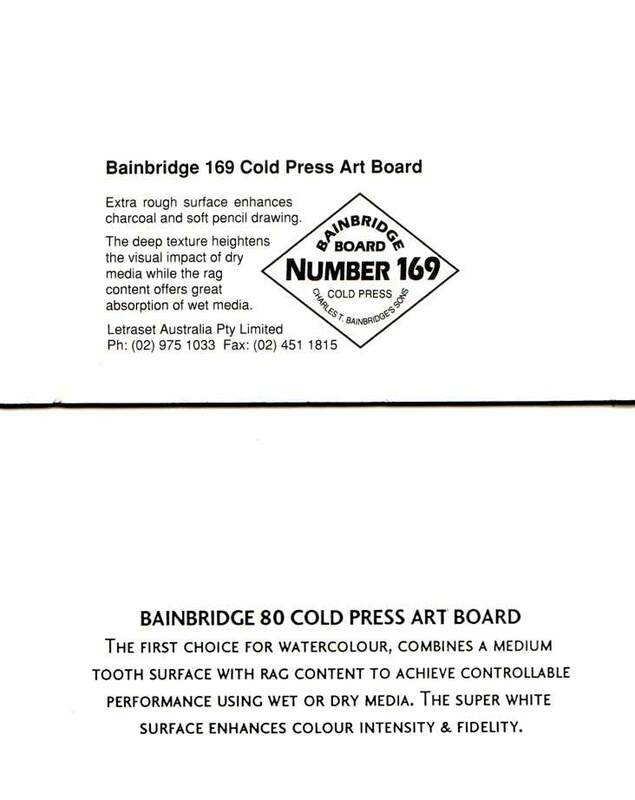 Bainbridge Illustration Board CP Medium 80 760mm x 510mm - A medium tooth surface with rag content to achieve controllable performance using wet or dry media. Bainbridge Illustration Board Rough 169 760mm x 510mm - The most textured of the three. Brown Kraft Roll 185gsm 1140mm x 100 metres - Heavyweight Kraft paper - ideal for craft and art applications and pattern making. Brown Kraft Roll 185gsm 1140mm x 20 metres - Heavyweight Kraft paper - ideal for craft and art applications and pattern making. Saunders Waterford Watercolour Paper- Cold Press - Medium - 190gsm - 560mm x 760mm This paper has been tested and approved by the Royal Watercolour Society- An acid free paper- This paper has four deckle edges and is both watermarked and embossed. Saunders Waterford Watercolour Paper - Cold Press - Medium - 300gsm - 560mm x 760mm - This paper has been tested and approved by the Royal Watercolour Society - an acid free paper - this paper has four deckle edges and is both watermarked and embossed. Saunders Waterford Watercolour Paper -Torchon - Rough 190gsm - 560mm x 760mm This paper has been tested and approved by the Royal Watercolour Society- An acid free paper- this paper has four deckle edges and is both watermarked and embossed. Saunders Waterford Watercolour Paper - Torchon - Rough - 300gsm 560mm x 760mm - This paper has been tested and approved by the Royal Watercolour Society - An acid free paper- This paper has four deckle edges and is bothy watermarked and embossed. 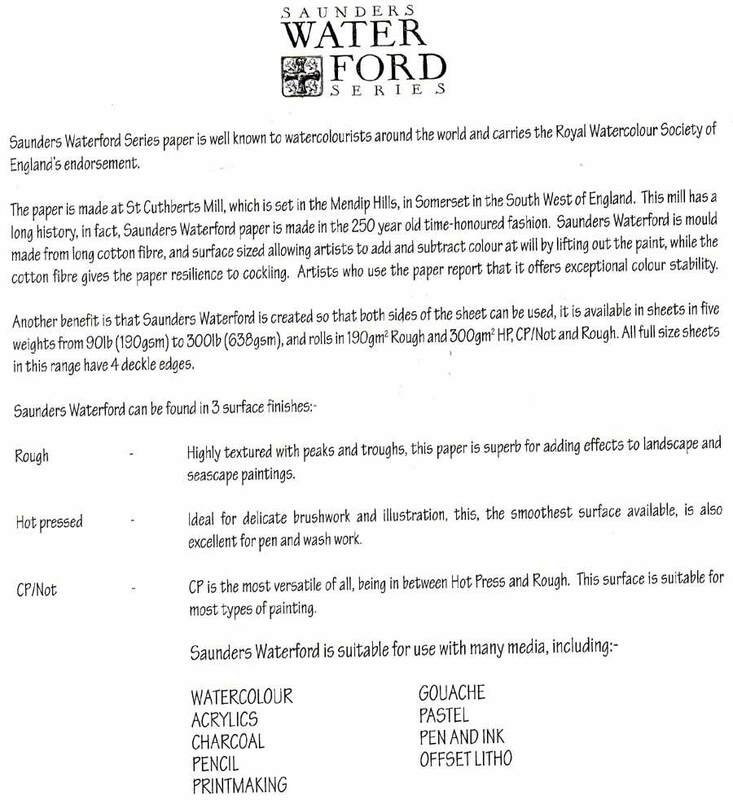 Saunders Waterford Watercolour Paper - Hot Press - Smooth - 190gsm - 560mm x 760mm - This paper has been tested and aproved by the Royal Watercolour Society- an acid free paper- This paper has four deckle edges and is both watermarked and embossed. Saunders Waterford Watercolour Paper - Hot Press - Smooth - 300gsm - 560mm x 760mm - This paper has been tested and approved by the Royal Watercolour Society- An acid free paper- This paper has four deckle edges and is both watermarked and embossed. Roymac Rains Watercolour Paper A3 Pack of 25 - Artist quality - 300gsm - Acid free - made in France from 100% cotton fibre - CP Medium. Aqua Watercolour Paper 300gsm 500mm x 700mm - CP Medium texture - Acid free - Watercolour and Multimedia applications, including wet and dry - excellent value - priced per sheet - sold in multiples of 10.